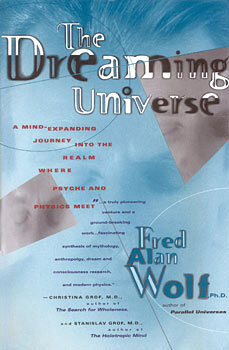 In The Dreaming Universe author Fred Alan Wolf examines the psychological and scientific elements of this most personal yet most enigmatic of human processes. By linking research ranging from the ancient Greek "dream temples" and modern experiments in telepathy, REM, and lucid dreaming to his own research on human consciousness, he theorizes that dreaming is the basis for consciousness, and that it is through dreaming that we are able to manifest a sense of ourselves. "Just when we thought that everything about dreams that could be written had already been published, along came Fred Alan Wolf with The Dreaming Universe. This provocative book explores dereamscapes that few other accounts have dared to mention. Some readers will be outraged by Wolf's proposals, others will be ebullient, but not one of them will be bored." "Fred Alan Wolf is on his most daring safari yet as he searches for the mysterious link between consciousness and reality. Sweeping and eclectic, The Dreaming Universe is everything Wolf's readers have come to expect over the years. If you've never read him before, it's a terrific place to begin." "The most important book on the nature and significance of dreams since Freud's The Interpretation of Dreams. The result is a ground-breaking, mind-bending excursion into the contemporary human psyche in ways so illuminating that even the universe itself is likely to be dazzled."